The Covington Buccaneers had a solid showing in the sectional tournament with a runner-up finish as a team, four individual champions and six more top-four players to qualify ten wrestlers to the district meet. Kellan Anderson works to turn his opponent during his championship macth at 106 pounds. 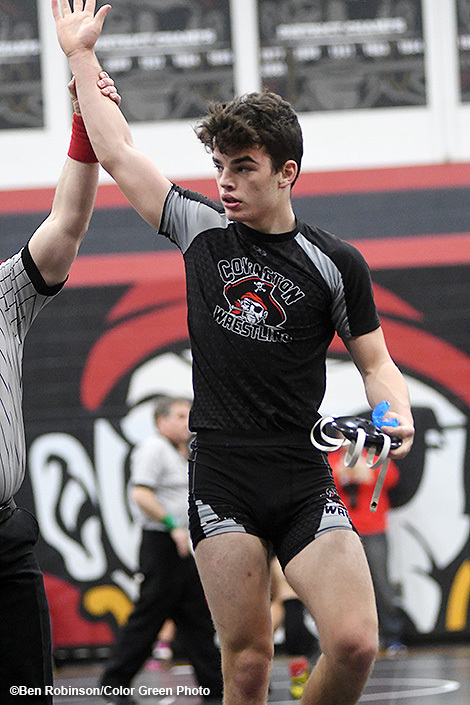 The Covington Buccaneers crowned a tournament-high four individual champions en route to a runner-up finish at the sectional wrestling meet at Covington High School on Saturday. The Buccs, who accumulated 191.5 team points, narrowly missed the team title as Mechanicsburg took the team championship with 196 points. For Covington, it had 10 wrestlers qualify for next week’s district meet and two wrestlers earned district alternate status by taking fifth. Kellan Anderson improved his unbeaten mark to 45-0 by defeating Caleb Schroder of Troy Christian 3-0 in the championship match at 106 pounds. Anderson, who entered the tournament as the top seed, advanced to the finals with an 11-0 major decision victory over Jesse Stroud of Mechanicsburg. Cael Vanderhorst won the sectional title at 113 pounds with a dominating 16-0 technical fall victory over Trey Allen of Mechanicsburg in the finals. Vanderhorst opened the tournament with a 1:21 pin on Andrew Collins of Milton-Union and advanced to the finals with a 2:16 pin of Kyle Kinder of Northeastern. In what was one of the most exciting matches of the tournament, Keringten Martin defeated Dylan Schenck of Milton-Union 3-2 with a third period takedown to claim the sectional title at 152 pounds. Martin defeated Andrew McKee of Northeastern via 2:37 pin to open the tournament and then pinned Kaden Langdon of Carlisle in 3:22 of his semifinals match. 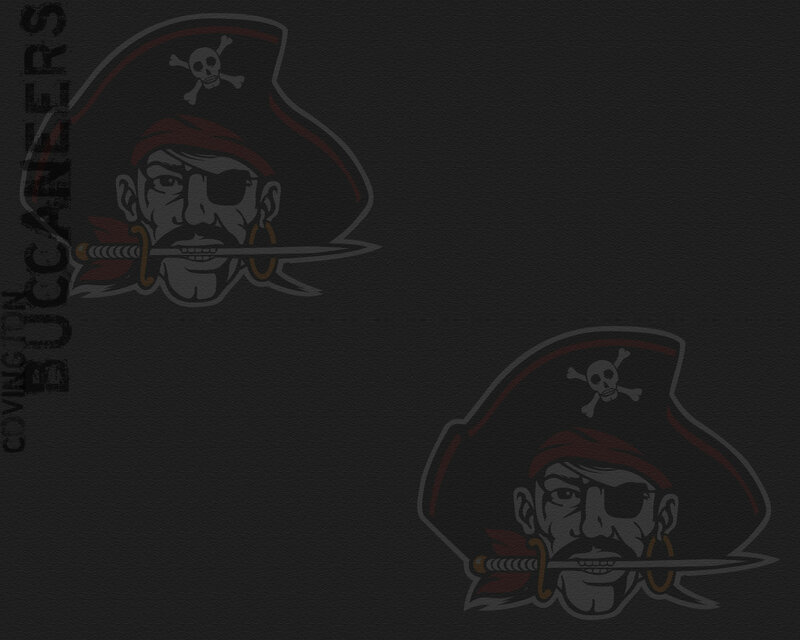 The fourth Buccaneer to claim a sectional title was senior 182-pounder Gavin McReynolds. Like Martin, McReynolds found himself in an exciting match in the finals and was able to pull out a gritty 3-2 win over Jesse Bisner of National Trail. McReynolds opened the tournament with a 34-second pin of Daniel Sulfridge of Southeastern and then pinned Codey Taylor of Northeastern in 1:49 to advance to the championship match. Austin Flick (145) and Dylan Burns (160) reached the finals before settling for second. Flick advanced to the championship match with a 5-2 victory over Isaac Bryant of Mechanicsburg and the was pinned in 1:31 by top-seed Ryan Whitten of Troy Christian in the finals, while Burns pinned Adam Waller of Mechanicsburg in 1:02 and defeated Cael Gostomsky of Arcanum 14-6 before falling to top-seed Hayden Pummel of Indian Lake 7-1 in the finals. Finishing third for Covington were Riley Richards (126), Duncan Cooper (170) and Jesse Fisher (195). 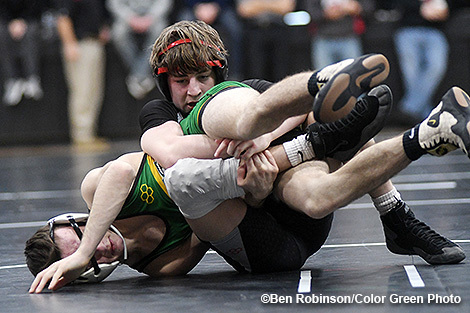 Richards defeated Aaron Beckman of Milton-Union 8-3 in the consolation final after opening the tournament with a 1:34 pin of Gage Cutlip-Pash of Indian Lake and then dropping a 6-3 decision to Justin Ritchie of Carlisle. He rebounded with a 4-2 win over Dakota Lay of Mechanicsburg to stamp his ticket to the consolation final and secure a birth at the district meet. Duncan Cooper wrestled a great tournament to take third at 170 pounds. He dropped a very close 7-4 decision to eventual champion Devin Oligee (41-1) of Middletown Madison in the semifinal, but rebounded with a 9-0 major decision victory over Gage Lowery of Indian Lake to advance to the consolation final. 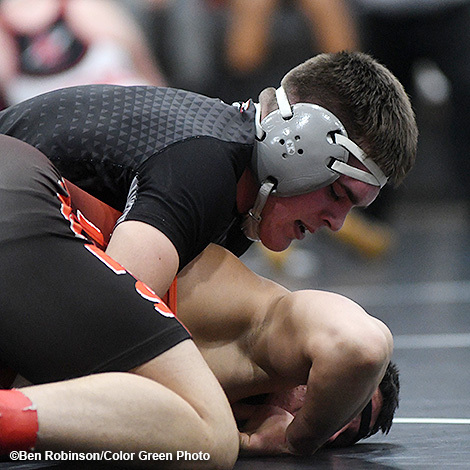 He then finished out his weekend with a 4-3 win over Jaron Patterson of Mechanicsburg. Jesse Fisher also had a memorable tournament as he defeated Connor Obee of Northeastern by default in the consolation final. Fisher fell into the consolation round with a loss to Caden Coleman of Mechanicsburg in the semifinal, but secured his spot at districts with a 38-second pin of Tyler Carl of Carlisle. Freshman Connor Sindelir advanced to districts by taking fourth at 132 pounds. After falling to top-seed Ethin Hoffman of Arcanum in the semifinals, Sindelir pinned Noah Steed of Indian Lake in 4:15 to secure a birth at districts. 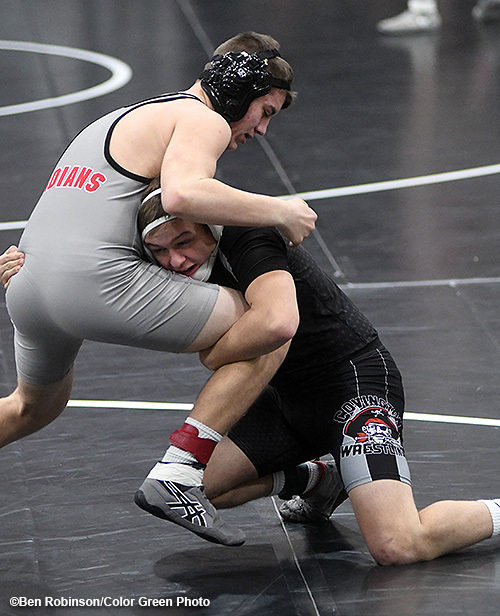 He then fell to Peyton Brown of Milton-Union in the consolation final. Earning district alternate status with fifth place finishes were Caleb Miller at 138 pounds and Dylan Staudt at 220 pounds. Miller defeated C.J. 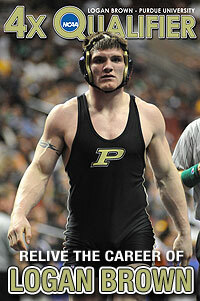 Worley of Carlisle 6-0 in his match for fifth place, while Staudt defeated Bradley Spears of Southeastern 7-2. Also competing for the Buccs in the sectional tournament was Clayton Stephan at heavyweight. The district meet will be held on Friday, March 1 and Saturday, March 2 at Hobart Arena in Troy. Cavin McReynolds is in control during his championship victory at 182 pounds. 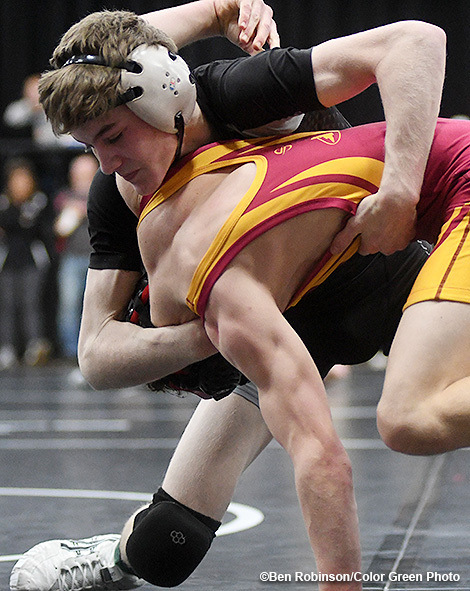 Cael Vanderhorst dominated en route to a championship at 113 pounds. Duncan Cooper has his hand raised after securing his spot at districts.